A haiku you wrote many years ago. This October did not disappoint either. Many mornings lying down in the park, looking up at the sky, watching kites, swallows, dragonflies, all who know lightness. You return from a week in a cold dark gray country and spend a whole day riding around in the light, walking around, soaking in the sun like you'd nearly lost it forever, delirious with gratitude. 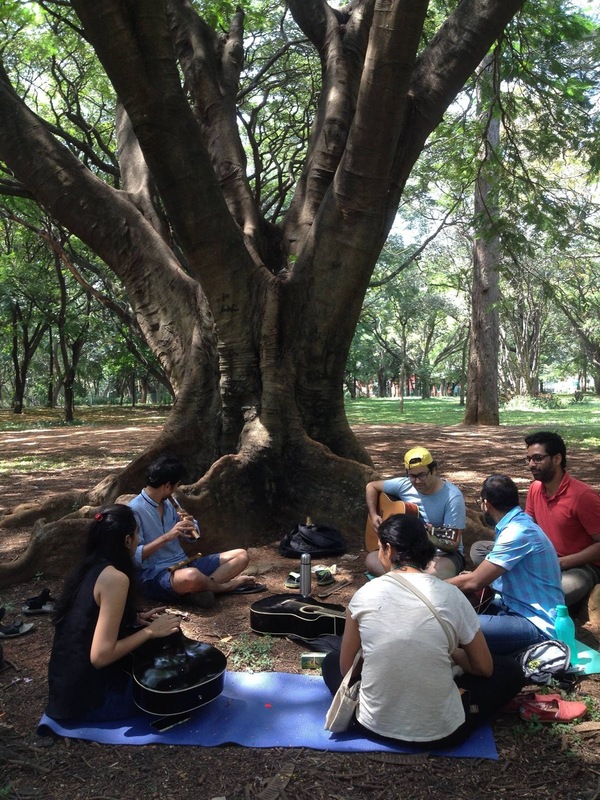 You come across this band of musicians who meet to jam under a beautiful gnarled Gulmohar tree every weekend, and you listen to their beautiful singing. They call themselves Folk Tree. Strangers come to listen to them at times. They invite requests. People suggest songs. This is what parks should be for. For the making of music and joy. You have been noticing how the park floor has been drying up little by little, post the south-west monsoon. The grass has been cut and left to dry, spongy beneath your feet. 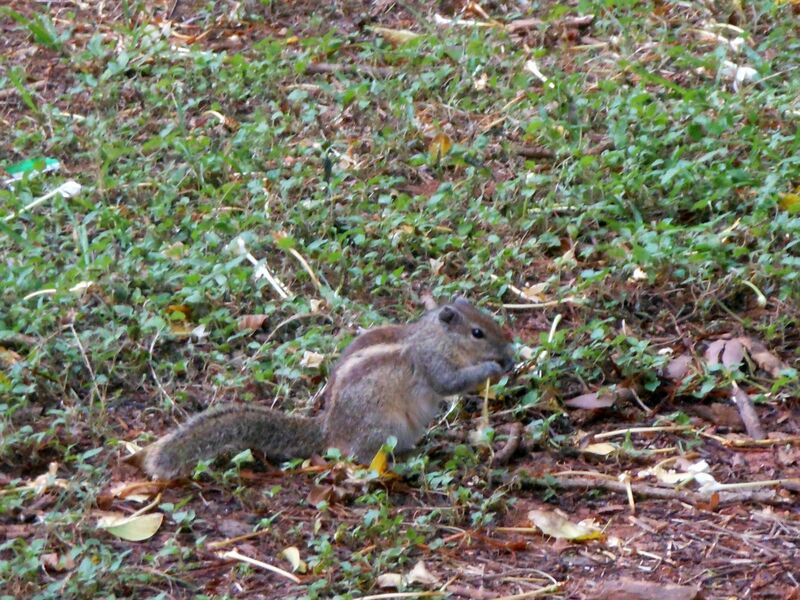 One morning you follow a squirrel carrying a big piece of dried grass, you know it must be going to its nest. You watch it jump from tree to tree, up there, to finally reach the hollow in which it is building a nest. You realize with a smile that you know the names of the entire squirrel path - the Aakaasha Mallige, the Gulmohar, the Rudrapalaash, the Cassia Javanica. :) You know everyone's names, you must belong here. The silk cotton tree has started yellowing in patches - you are surprised, you didn't know it has an autumn, this tropical tree. The leaves are more sparse, the ground below drying up. One day you come across a rat snake along the edge of the cement platform. You notice that you haven't heard the barbets in a month now. You wonder where they have gone. You come in early one morning, before daybreak, to see how the park feels in the dark. The moon, seen between the rain tree canopies, beautiful. A few people already walking, jogging. You catch the first rays of light on the upper branches of the silk cotton tree. 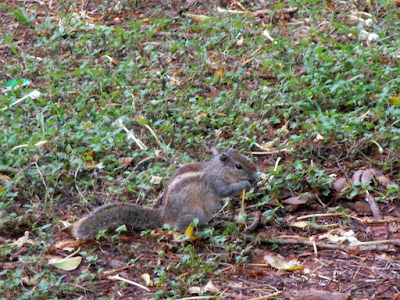 You stand still and watch a squirrel move slowly, sucking on Aakaasha Mallige flowers. It has just come down from the trees, and is feeding, not yet sprightly, not yet doing the crazy squirrel stuff they always seem to do, chasing each other up and down trees. You have been standing still and it comes close to you, not minding. You wonder at its simple life, coming down from the tree every morning, taking what nature offers that day. You have been also waiting for the blooming of the tabebuia impetignosas every week, the pink fist-bunches of lightness. They are blooming, in small patches, but the leaves are yet to fall fully, it is slow this year. Last year was so stunning, so breathtaking, you cannot possibly ask for more. You will wait, and take what is offered too. You will not complain. More dry leaves under the silk cotton tree. More browns everywhere. The leaves fall down on you in the wind occasionally as you lie down and watch the kites. You notice how smoothly the dark rainy wet months have transitioned into this light dryness. How so much has changed. You notice that you have been learning to live in the present, in the Now, more than ever before. More than ever you know that your imagination is limited, you have no way to predict what will come your way, good or bad. Maybe this ritual has played a part in preparing you for that? This regular seeing, this receiving, this documenting of the Now. Your moments of happiness are less clouded by the future, the whatifs, your usual paranoia of loss, your perennial preparation for the worst, the conditioning of the past. Perhaps this ritual has synced you with the rhythm of the universe, the many comings and goings of things, all beyond your control. The only surety, what you have now, in this moment. You receive each drop of Joy like holy water, your head bent. As the sun moves towards Uttaraayan, as yet another year catapults towards its end, you walk under falling leaves, grateful. You bring such joy, Asha. Thank you, as always.